When you place a Goliath bet, you are placing 247 bets on eight different selections. A £1 win-only Goliath bet would, therefore, cost a hefty £247. A Goliath contains no single bets. At least two selections of the eight must win for any return to be achieved on the bet. Work out your winnings with our Goliath Bet Calculator. How Many Selections Need to Win for a Goliath to Be Profitable? The price of each selection will have a large influence on how many selections need to win for a Goliath to be profitable. If only two only selections win, these selections must have very high odds in order for the overall bet to return a profit. We have provided an example to give an indication of generally how many winning selections might generate a profit. 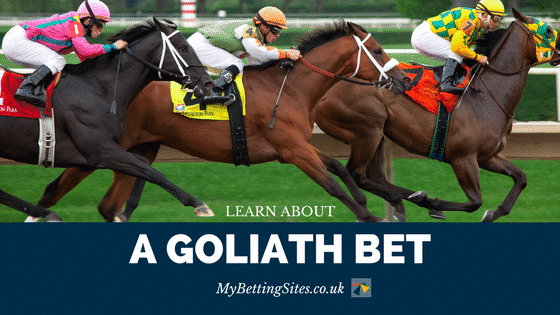 Example – you bet £1 on a Goliath at a total stake of £247. Each horse is priced at 4.00. The breakeven point in the example is around four winning selections. Five or more is likely to generate a tidy profit. Although these are only example prices, it is apparent how incredible the returns could be for Goliath if all selections win. The very high returns a Goliath can generate as demonstrated above are appealing to punters. The same high return could be achieved with an eight-fold accumulator, but it would require all selections to win for any return to be generated. A Goliath bet is a more exciting way to bet on a multiple as it increases the chance of a return. Providing two of the eight selections win, some returns will be generated. The disadvantage of a Goliath bet is the mammoth stake it requires. With 247 bets instead of one, the stake will be very higher. Some will prefer a 50p stake rather than £1, but even then the stake remains very high for the average punter. Is It Possible to Do an Each Way Goliath? Yes. If your pockets are deep enough! An each way Goliath bet consists of 494 bets. 247 bets are as described above, and 247 additional bets are for the selections to place. A Goliath bet consists of 247 bets over eight different selections. It has 28 doubles, 56 trebles, 70 four-fold accumulators, 56 five-fold accumulators, 28 six-fold accumulators, eight seven-fold accumulators and one eight-fold accumulator. Although it has a significantly higher stake than a traditional accumulator, it does make a return more likely.